People tend to read health articles that have gone viral online. A large portion of online popular vaccine articles are against vaccines, which lead to increased exemption rates and recent outbreaks of vaccine-preventable diseases. Since anti-vaccine articles’ themes and persuasive strategies change fast, their effects on viewers’ behaviors may change over time. This study examined how pro- and anti-vaccine topics and public interests have changed from 2007 to 2017. 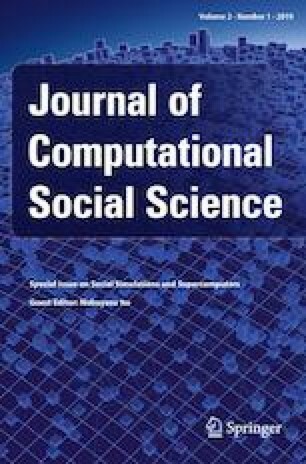 Computational methods (e.g., topic modeling) were used to analyze 923 online vaccine articles and over 4 million shares, reactions, and comments that they have received on social media. Pro-vaccine messages (PVMs) that used personal stories received the most heated discussion online and pure scientific knowledge received the least attention. PVMs that present vaccine disagreements and limitations were not popular. These findings indicate the importance of narratives and directly attacking opposing arguments in health message design. Anti-vaccine messages (AVMs) that discussed flu shots and government conspiracy received the most attention. Since April 2015, even though more PVMs appeared online, AVMs, especially those about vaccine damage, were increasingly more popular than PVMs. Some social events and disease outbreaks might contribute to the popularity of AVMs. Newly emerged anti-vaccine topics (e.g., false rumors of CDC conspiracy) should be noted. This study shows that certain topics can be more popular online and can potentially reach a larger population. It also reveals the evolution of vaccine-related topics and public’s interest. Findings can help to design effective interventions and develop programs to track and combat misinformation. Today, people can find health information online. According to the Pew Research Center, more than 70% of U.S. internet users search for health information online, and nearly 80% of them start from using a search engine such as Google. One in three U.S. adults try to diagnose a medical condition online . However, the Internet contains misinformation that can influence attitudes and behaviors adversely and eventually harm public health . Health misinformation, which is against established medical understanding , can be distributed broadly to reach a large population in a short time in the digital age . However, efforts to counteract misinformation, such as using repeated warnings and retractions, may backfire and increase misconceptions . Vaccine-related misinformation, which is often spread online by anti-vaccine groups , may be the most widely disseminated health-related misinformation . Anti-vaccine content exists in many of the vaccine-related top Google search results [6, 8]. Anti-vaccine articles are more likely to be shared, commented and reacted online than pro-vaccine messages . Online anti-vaccine messages can lead parents to question the safety of vaccine, distrust health professionals, and seek non-medical vaccine exemptions [10, 11], which in the end may lead to outbreaks of vaccine-preventable diseases such as measles, mumps and whooping cough [12, 13]. According to previous studies, two main factors lead to the persuasiveness and popularity of vaccine misinformation: distrust of public health agencies and emotional narrative within vaccine messages. Anti-vaccine articles often discredit professional health organizations by creating conspiracy theories. Anti-vaccine headlines are more likely to include words that foster distrust of public health organizations . Anti-vaccine websites often claim that governments, public health organizations, and companies hide the side effects of vaccines and promote vaccines only for profit . The second strategy that vaccine misinformation often uses is creating emotional content. For example, the headlines of online anti-vaccine articles contain significantly more emotion words that are related to fear, anger, and sadness than pro-vaccine headlines . By including emotional narratives such as stories about children who died from vaccines, vaccine misinformation can increase risk perceptions and discourage vaccine intentions [8, 14, 15]. RQ1: What are the most commonly appearing pro- and anti-vaccine topics online? RQ2: What pro- and anti-vaccine topics receive the most online popularity? RQ3: How have the topics in pro- and anti-vaccine online articles evolved over time? RQ4: How have people’s interests in different vaccine topics evolved over time? More than 90% of internet searches are conducted via Google platforms, which make Google the most widely and frequently used search engine . Thus, Google was chosen to obtain vaccine-related webpages. The present study searched several combinations of terms capturing the effects of vaccines in Google, respectively. These search terms included: vaccine + danger, vaccine + harm, vaccine + secret, vaccine + death, vaccine + injury, vaccine + hidden, vaccine + fact, vaccine + statistics, vaccine + benefit, vaccine + important, vaccine + reason, vaccine + information. The first 200 results of each search term were included in the current study on May 5, 2017. One article could be captured multiple times by the different search terms. After duplication check, 2067 unique articles’ URLs were entered into an Excel sheet. Two trained coders checked if each article met the criteria to be included in the final analysis. Articles were included if they (a) were active links; (b) focused on human vaccines; (c) indicated that people should or should not get vaccinated; (d) discussed benefits/risks of vaccines. Articles were excluded if they (a) were not written in English; (b) only contained a video without any text description; (c) were listserv, newsgroup, or discussion board pages; (d) required downloading. After excluding those that did not meet the requirements, coders assigned the article into either pro- or anti-vaccine articles (intraclass correlation = .92) and solved disagreements by discussion. In the end, 541 pro-vaccine articles and 382 anti-vaccine articles were included in the final analysis. Publication date. Day, month, and year when an article was first published online were obtained. Online popularity. SharedCount (https://www.sharedcount.com) was used to reveal the number of times that an article was shared, reacted, and commented on Facebook, Google+, LinkedIn, Pinterest, and StumbleUpon. Online popularity was measured using two indicators. The sum of topic popularity (Nsum) consisted of the total number of the shares, reactions, and comments across all articles within a topic. Average topic popularity (Naverage) was computed from the sum of topic polarity divided by the number of articles belonging to the topic (Narticle). Previous studies often use human coders to manually categorize anti-vaccine websites into several topics. For example, a study categorized 150 anti-vaccine articles into eight groups (e.g., safety and effectiveness, alternative medicine, emotive appeals, etc.) . Another study grouped 25 sites into four subcategories (e.g., civil liberties, conspiracy theories, etc.) . However, content analysis that manually categorizes topics can have low reliability, since coders often need to use intuition to group contents . Topic modeling, which relies on machine learning algorithms to fully automatically categorize the emergence of topics in a research field, can be an alternative. Topic modeling is based on Bayes’ hierarchical model. It can discover patterns of words and group documents with similar patterns from unstructured data [21, 22]. One of the most popular methods of topic modeling is the latent Dirichlet allocation (LDA) model. In LDA, “a topic is defined to be a distribution over a fixed vocabulary of terms” . LDA estimates the probability distribution of topics on each word, the importance of words to each topic, and the prevalence of words in each document. Based on all the information, the algorithm estimates probabilities of topics on each documents. LDA has been validated by many studies [23, 24, 25, 26]. For example, using 2620 abstracts published in Proceedings of the National Academy of Sciences, Griffiths and Steyvers  discovered a strong association between topics classified by topic modeling algorithm and paper categories selected by authors when they submitted the paper. In the health domain, topic modeling has been predominately used to study public discussion and opinion about health topics (e.g., HPV vaccine, e-cigarette, Ebola, etc.) on social media and other online platforms [27, 28, 29]. These studies successfully monitored the dissemination of health information as well as analyzed public knowledge and behaviors. 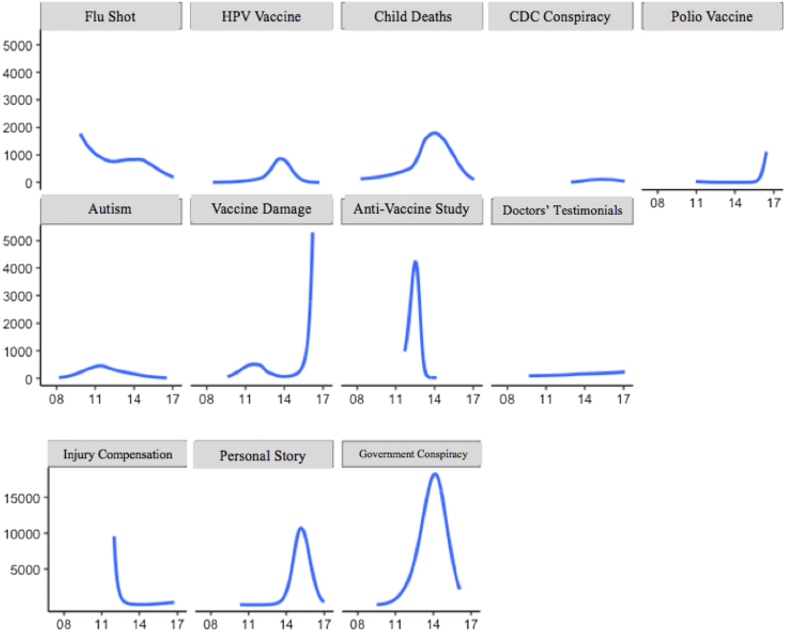 In the present study, topic modeling is used to identify the topics in pro- and anti-vaccine online articles. Pro- and anti-vaccine messages and topics were handled separately. First, word frequencies in pro- and anti-vaccine messages were calculated. Function words (e.g., “the”, “of”, etc.) were deleted before analysis. Second, the number of topics in pro- and anti-vaccine messages was determined by comparing 4 algorithms [23, 24, 25, 26] within the range of 2–70 topics using the R topicmodels package, which is a free and open-source R package. We conducted 35 runs before determining the most suitable number of topics by optimizing the parameters of 4 algorithms. Then, we generated topics for pro- and anti-vaccine messages using LDA topic modeling. The LDA model returned top terms in each topic. Based on these terms, a name was assigned to each topic to facilitate readers’ understanding. Twenty percent of articles within each topic were randomly selected and manually checked to validate that the topic name was highly related to those messages. 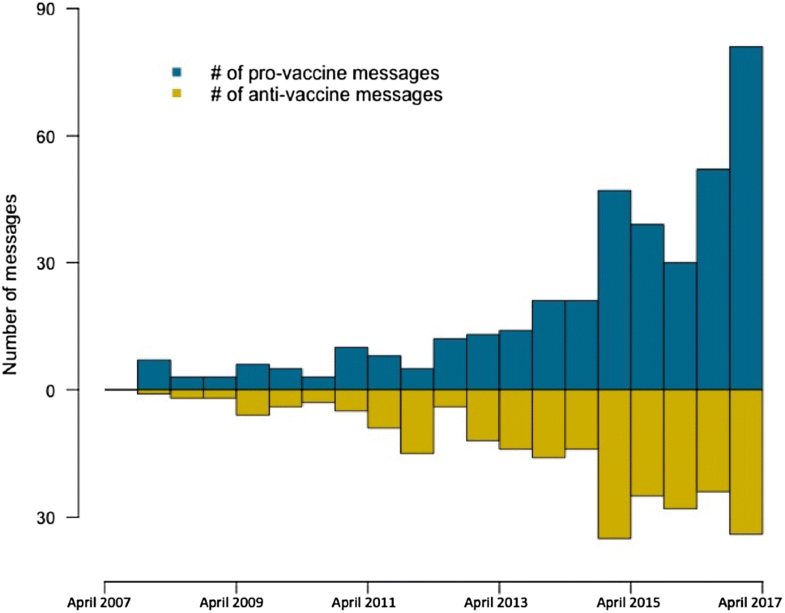 Next, online popularity of topics in pro- and anti-vaccine messages was aggregated in 6-month intervals (April–October, October–April of next year). The intervals were chosen to differentiate flu season and non-flu season. Online popularity of topics in pro- and anti-vaccine messages in 6-month intervals was plotted using barplot. Finally, the locally weighted scatterplot smoothing (LOESS) method  was used to create smooth lines of online popularity over a decade from April 2007 to April 2017. LOESS is a non-parametric method and robust to outliers. The final analysis included 508,571 words from 541 pro-vaccine messages (MED = 669) and 843,805 words from 382 anti-vaccine messages (MED = 1096). Topic modeling identified 14 topics in pro-vaccine messages and 12 topics in anti-vaccine messages. Tables 1 and 2 presented four of the most representative terms of each topic and the names that were assigned to each topic. For example, top terms in one of the pro-vaccine topics included HPV, cancer, women, and cervix. These terms implied that this topic mainly discussed HPV vaccine. Thus, the name assigned to this topic was HPV Vaccine. Pro- and anti-vaccine messages shared some similar topics, such as HPV vaccine, flu shot, and adverse case. They both used personal stories and studies to persuade viewers. RQ1 and RQ2 asked about the most common and popular topics in pro- and anti-vaccine online articles. Results indicate that the most frequently discussed pro-vaccine topic was flu shot (Narticle = 82). The least frequently discussed pro-vaccine topic was the one that reviewed the development of vaccines (Narticle = 10). The topic that used personal story to support vaccines received the highest number of shares, reactions, and comments (Nsum = 1,240,291) even though only 37 articles fell into this topic. On average, each message was shared, commented, and reacted to 33,521 times online. In contrast, people cared less about vaccine guidelines. On average, each message was shared, commented, and reacted to 116 times online. Regarding anti-vaccine topics, the most frequently appearing topic was child death (Narticle = 109). Articles discussing polio vaccine (Narticle = 4) and anti-vaccine study (Narticle = 5) were rarely seen online. Child death was also the most popular anti-vaccine topic online in terms of the sum of popularity (Nsum = 857,570). Considering the average popularity of each article, flu shot (Naverage = 16,879), government conspiracy (Naverage = 11,286), and personal story (Naverage = 8791) topics received the most attention online. Polio vaccine danger was the least popular topic (Naverage = 340). The next step is to consider how topics in pro- and anti-vaccine messages and their online popularity have changed over the last 10 years to answer RQ3 and RQ4. Figure 1 compares the number of pro- and anti-vaccine messages from top Google search results. Since April 2015, and especially after 2016, more pro-vaccine messages appeared in top Google search results than anti-vaccine messages. However, as illustrated in Fig. 2, since April 2015, anti-vaccine messages were more popular online than pro-vaccine messages. 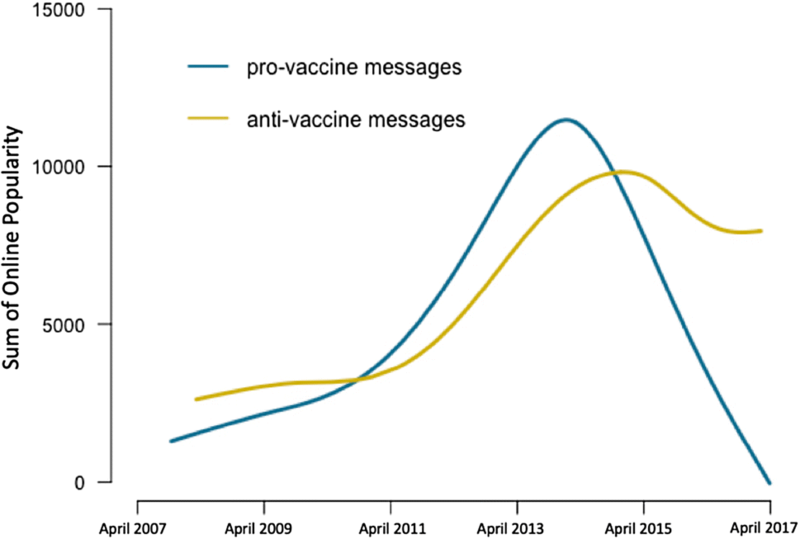 The comparative popularity of anti-vaccine messages increased fast. The online popularity of pro-vaccine messages peaked around the end of 2013, after which the number of comments, reposts, and likes decreased dramatically. Figure 3 displays the trends in pro-vaccine topic and their online popularity since April 2007, plotting time on the x axis and the sum of topic’s popularity on the y axis. It is important to note that some of the scales on the y axis are different from others. Online popularity of several topics (ingredients, personal story, vaccines for children, parents’ hesitancy, adverse case, and development) peaked between 2014 and 2015. Articles that focused on vaccine benefit and adverse case gradually lost interest among viewers. Trends in anti-vaccine topic articles and popularity since April 2007 appear in Fig. 4. Vaccine damage articles witnessed a significant increase in popularity since 2016, as did polio vaccine. However, only 4 articles matched this topic. Articles that focused on CDC conspiracy emerged recently, around 2013. Flu shot and vaccine injury compensation gradually lost popularity among readers. Online popularity of child deaths, personal story and government conspiracy peaked between the end of 2014 and the beginning of 2015. This is the first study to explore topics and online popularity trends in pro- and anti-vaccine messages over time. It also shows that topic modeling can be used to effectively quantify and visualize topic changes across large datasets. Its methods and findings can be applied to other health topics and research areas. Both pro- and anti-vaccine messages use narratives, such as personal stories and testimonials, to persuade viewers. Anti-vaccine narratives usually include personal stories that children were hurt or killed by vaccines and their parents were devastated [8, 14]. Anti-vaccine messages also include doctors’ testimonies about the danger of vaccines. These anti-vaccine messages often claim that these doctors are well educated, experienced, and serve as members of some organizations. They stop and delay vaccines because of their research and observations of vaccine danger [e.g., 31]. In contrast, pro-vaccine narratives often include stories about parents feeling guilty because their unvaccinated children were killed by vaccine-preventable disease [e.g., 32]. The results of the present study imply that true information with narratives can reach a larger population than messages mainly including scientific knowledge (e.g., guidelines and development of vaccines). The fact that more people are exposed to and are interested in narratives increases the possibility that narratives can change related attitudes and behaviors. The transportation-imagery model can explain the persuasive power of narratives. According to the model, viewers who are exposed to narrative information can be “transported” into the story by their feelings and imagination. Transported viewers tend to identify with the characters and have strong emotional responses to the stories. Thus, they may be more likely to believe the stories and less likely to question the narratives, which lead to potential attitudes or behavior changes [33, 34]. This finding is useful for message designers. Currently, not many pro-vaccine articles use narratives. Personal stories should be included more often in pro-vaccine messages to attract the audience. Overall, more pro-vaccine articles than anti-vaccine articles appear on the internet. However, since April 2015, these pro-vaccine articles received less attention and reached fewer people than anti-vaccine articles. According to Del Vicario and colleagues’ study that examined the dissemination of true and false political stories on Facebook, true information only gains interest shortly after it is published and loses popularity among viewers quickly . In contrast, fake information can remain popular for a much longer time. Thus, we may predict that anti-vaccine articles that already gained much attention since April 2015 may continue to be spread quickly. The present study implies that misinformation can be increasingly popular during times of uncertainty. For example, since 2016, the advantage of anti-vaccine messages’ online popularity over pro-vaccine is increasing. In addition, the number of anti-vaccine articles about vaccine damage increased drastically since 2016. By looking at discussions related to vaccine in 2016 using Google trend, President Donald Trump and vaccine skeptic Robert F. Kennedy’s statements, in which they linked autism to vaccine, questioned vaccine safety, and distrusted doctors, received substantial attention online. These statements may encourage the anti-vaccine movement and result in public confusion. Another example is the fact that two anti-vaccine topics, personal stories and government conspiracy, received the most shares, comments and reactions online from the end of 2014 to the beginning of 2015. During this period of time, a measles outbreak took place in Disney theme parks in California, causing 125 measles cases. Among the California patients, 45% were unvaccinated . This event soon became a national story and led to heated debates . Anti-vaccine groups regarded this outbreak as a proof of the ineffectiveness of vaccines, since the majority of victims were vaccinated. They claimed that the outbreak was more likely to be caused by a recently vaccinated individual and public health organizations should not be trusted [e.g., 38]. In this time of uncertainty, the online popularity of pro-vaccine messages continued to decrease, while anti-vaccine messages were increasingly popular and overpowered pro-vaccine messages in the end. People tend to rely on emotions to make decisions when they experience uncertainty . Therefore, people may be more inclined to read or even trust misinformation when they are confused and anxious. Future studies are expected to examine if uncertainty can lead people to seek and trust misinformation. Scientific and true information often present disagreements and limitations [40, 41], which in persuasion are referred to as a two-sided message . For example, some of the pro-vaccine topics discuss negative points such as side effects, parents’ hesitancy, and adverse case. However, presenting negative information to promote a behavior may not be effective. Dixon and Clarke found that participants who read articles that present disagreements on autism–vaccine link were more uncertain about vaccines safety and were less likely to vaccinate their children . A meta-analysis reveals that non-advertising topics, such as topics that promote vaccines, can be more persuasive when they use refutational two-sided messages than non-refutational two-sided messages and one-sided messages . This finding indicates that messages can be more persuasive when they directly attack opposing arguments than when they only acknowledge the opposing side or do not include any opposing statements. This result can explain the popularity of anti-vaccine messages. Many anti-vaccine topics directly attack organizations that support vaccines, while some pro-vaccine topics only acknowledge the opposing statements by admitting that vaccines have side effects. Future research can explore if pro-vaccine messages, which directly attack anti-vaccine groups followed by explaining vaccine side effects, can be popular and convincing. The current study reveals that topic modeling can be a powerful tool for health practitioners to capture the changes in the public interests. For example, as the public gradually loses interest in articles about vaccine benefits, message designers can avoid creating more articles that focus purely on vaccine benefits. Since personal stories are increasingly popular, message designers can create more interventions inviting parents to share their own experience. This study also shows that topic modeling can be used to monitor the dissemination of misinformation. Newly developed anti-vaccine topics bring pro-vaccine message designers new challenges. It is important for health educators to monitor the changes of hot topics in health misinformation to know the targeted areas to disseminate true information. For example, since anti-vaccine groups started to use CDC conspiracy and anti-vaccine studies to persuade viewers, health educators should address public’s knowledge gap by explaining problems in anti-vaccine research, as well as increase the public’s trust of CDC and other public health organizations. Before drawing the conclusion, it is important to note that this study examines the popularity of vaccine-related articles only between April 2007 and April 2017. Some articles may be more popular in the future. In addition, Facebook stories, twitter posts, and videos were not included in the present study. Since online popularity of articles may vary in different social media platforms , future studies should explore vaccine-related contents and popularity on other platforms. Next, more search engine results (e.g., bing.com) should be included to avoid search engine bias. Finally, articles that contained both narrative elements and scientific knowledge were assigned to one topic automatically by machine learning algorithms. It is possible that a combination of both contents can be more popular than articles that only use personal stories or scientific information. Future studies can use human coders to manually examine and compare detailed strategies used in the most popular vaccine topics, as well as investigate if a combination of techniques used in vaccine messages can lead to the highest level of online popularity. In sum, the present study uses topic modeling to categorize pro- and anti-vaccine online articles’ topics automatically. It shows that certain topics can be more popular online and can potentially reach a larger population. 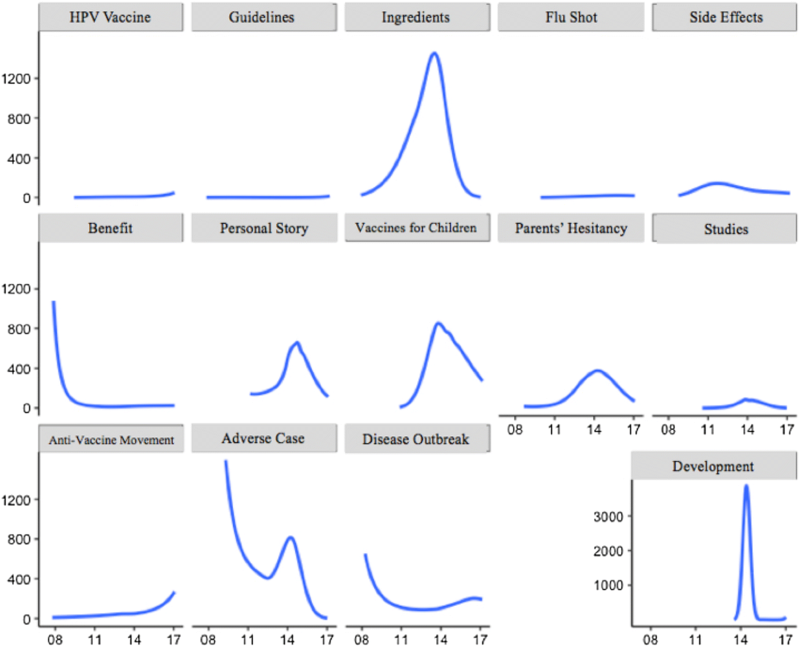 It also reveals the evolution of vaccine-related topics and public’s interest. These findings can help researchers to design effective interventions as well as develop programs to track and combat health misinformation. Fox, S., & Duggan, M. (2013). Health online 2013. Pew Internet & American Life Project, 1–4. Retrieved from http://www.pewinternet.org/~/media/Files/Reports/PIP_HealthOnline.pdf%5Cnhttp://www.pewinternet.org/2013/01/15/health-online-2013/#. Ghenai, A. (2017). Health misinformation in search and social media. In Proceedings of the 2017 international conference on digital health—DH’17 (pp. 235–236). http://doi.org/10.1145/3079452.3079483. Jones, A. M., Omer, S. B., Bednarczyk, R. A., Halsey, N. A., Moulton, L. H., & Salmon, D. (2012). Parents’ source of vaccine information and impact on vaccine attitudes, beliefs, and nonmedical exemptions. Advances in Preventive Medicine, 2012 (February 2004), 1–8. http://doi.org/10.1155/2012/932741. Desjardins, J. (2018). How Google retains more than 90% of market share. Retrieved from https://www.businessinsider.com/how-google-retains-more-than-90-of-market-share-2018-4. Arun, R., Suresh, V., Madhavan, C. E. V., & Murty, M. N. (2010). On finding the natural number of topics with latent Dirichlet allocation: Some observations. In Lecture notes in computer science (including subseries lecture notes in artificial intelligence and lecture notes in bioinformatics) (Vol. 6118 LNAI, pp. 391–402). http://doi.org/10.1007/978-3-642-13657-3_43. Edwards, J. (2015). Doctors against vaccines—Hear from those who have done the research. Retrieved from http://www.organiclifestylemagazine.com/doctors-against-vaccines-hear-from-those-who-have-done-the-research. Mulroy, Z. (2017). Distraught mum’s powerful vaccination message to parents after baby’s tragic death. Retrieved from http://www.mirror.co.uk/lifestyle/family/distraught-mums-powerful-vaccination-message-9610620. Huff, E. A. (2015). Only 14% of people in Disneyland measles outbreak were unvaccinated, but it’s 100% their fault, claims propaganda. Retrieved from https://www.naturalnews.com/049351_measles_outbreak_MMR_vaccine_Disneyland.html.